Mehran Azmoudeh is president of the Association Internationale des Anciens Roséens, the alumni organization of Le Rosey. Thousands of alumni are still closely attached to the school and share a network that spans around the globe. Once a year, they come together in Gstaad. Could you start off by telling us a bit about yourself and your time at Le Rosey? Thank you. It’s an honour to be interviewed by GstaadLife. I first came to Switzerland when I was 6 or 7 years old and attended summer camps in Crans-Montana and Le Rosey. I was scheduled to go back to school in Iran in the fall of 1978 but the revolution had started and major upheavals lay ahead. My sisters were already at Le Rosey and I decided to join them. So, at the age of 8, I started as a border in the junior section. This was a very special space with limited interaction with the rest of the school. My first experience of Gstaad was the winter of 1979. I had already learned to ski in Iran but it was the first time I skied in the high mountains. We went on excursions every Thursday and this exposed me to a really great Swiss alpine experience at a very young age. Did you find Le Rosey a culture shock after Iran? Not really. I had been in an American school in Iran so my English was good. The biggest shock was that everything in the junior school was in French so, for the first three months, I didn’t understand much. However, thanks to the diversity of nationalities at Le Rosey, there were a few other Iranian students besides my sisters. Back home, this was the time of the hostage crisis – a difficult period. For me, however, the school was a very safe place. It provided me with a sense of security that was especially important as my parents hadn’t yet found a place to settle down and make a new home. Knowing that I would be going back to my school, to the same people, the same rooms, the same routines and so on was the one constant in my life. What is it that makes the Association Internationale des Anciens Roséens (AIAR) special? To understand the AIAR, you really need to understand the social culture of Le Rosey. The students come from many different countries, cultures, experiences and backgrounds and end up living together in a boarding establishment, far from parents and home. This factor contributes to an intangible quality in the school that fosters incredibly strong bonds and friendships between the students. This is the strongest “force” that comes from the school and I feel it is what sustains the AIAR. We are friends for life – in fact, not only friends for life, we are family. To come back to the Association, the way it is run is quite interesting. We have one full-time employee and about 5000 members, 4000 of whom are quite active. We also have over 100 full-time volunteers – the entire Association around the world is organized by volunteers. We have quite a hierarchical structure whereby the volunteers are assigned particular duties in terms of activities. When you graduate from Le Rosey you pay a single life-time fee. This makes us all stakeholders in the Association. Well, it starts with me! I’m volunteer number one, so I dedicate a lot of my own time. I have a very competent committee. Each of them has a specific area of responsibility: class and/or country representative, events, trips, social media, administration, legal issues, etc. They are the ones who run the AIAR. All I do is support them. The committee members lead such busy lives, running their respective businesses all over the world, that I confess to exploiting their love for Le Rosey in order to get their help for the AIAR! One of my favourite projects is to help Le Rosey students find internships after they graduate. It’s been the most rewarding of my activities and is closest to my heart – it’s what gives me the most satisfaction. So that is the board level. What happens at the country level? Within each country where we have alumni there is a satellite association with a locally nominated head – basically our ambassadors. In the United Kingdom, for example, where we have many alumni, we are fortunate in having two very competent AIAR women in charge. They organize annual dinners and help connect members and share information. Each year they have a welcome lunch for the newest members. They also invite alumni who have graduated within the previous 10 years to participate so they can meet and help the younger graduates getting settled into a new life, university, where to live, and so on. Is it part of your job to promote Le Rosey? Le Rosey has its own programme for presenting the school and the summer camps to prospective parents around the world. However, the AIAR and former alumni do help in some ways. If, for example, Le Rosey is planning a trip to Singapore, they will get in touch with the local AIAR representative, who will organize a dinner for them and help with any support that may be needed. So, we are complementary and maintain a great relationship with the school. Do you see a change in the demographics and nationalities of students who are now going to Le Rosey? Yes, this shifts with time. I was there in the eighties, before the fall of the wall. Political and economic changes around the world influence the number of applicants from affected countries. What happens in Le Rosey is interesting. The school has a quota system which ensures a maximum of 10% of students from any single country. The directeur général, Christophe Gudin, is incredibly good at ensuring that the school keeps this balance. I believe students form some 70 nationalities visit the school today. 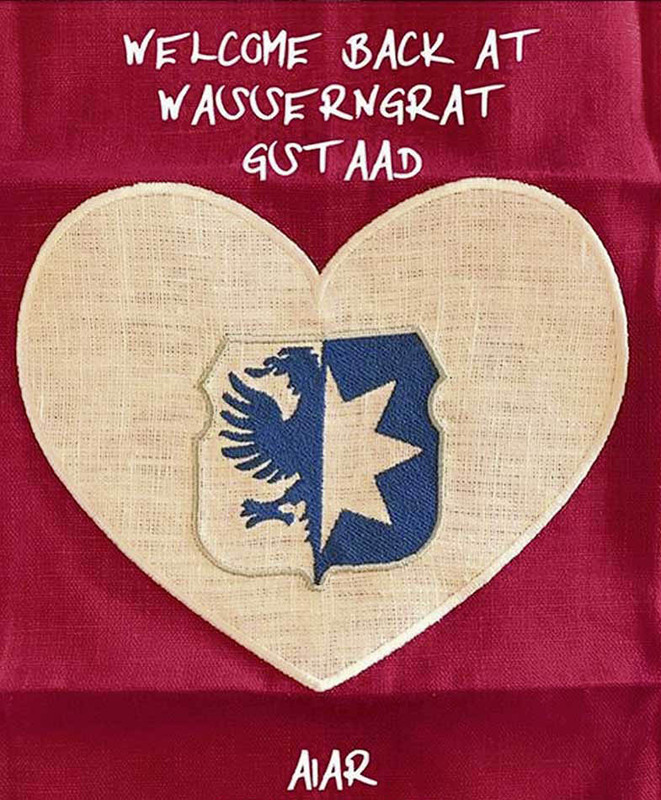 What is AIAR’s relationship with Gstaad? We organize a long weekend each year for alumni from all over the world to meet up for dinners and a number of other activities, the main event being our annual general assembly. We always hold this long weekend in Gstaad so it’s one of the reasons we think of Gstaad as the home of the AIAR. The graduating class of the year, usually 50 to 70 students, always join the alumni for the weekend. This year the weekend officially starts on Friday, 15 February. However, it starts unofficially on Thursday night, when Marie-Noëlle Gudin organises a fantastic dinner for the Rosey Foundation. Several other dinners also take place that night – many among classes that are celebrating anniversaries such as 10, 20 or 30 years since their graduation. Last year was my 30th anniversary and around 40 of my classmates came back for the occasion. On Friday, we all go up to the Wasserngrat for ski races, where all the current Rosey students and many of our alumni participate. Fortunately, the older alumni receive a generous handicap, which helps us keep up. We have great races till around noon and then, in the afternoon, we have curling and an ice-hockey match between the alumni and current Rosey students. I’m proud to announce that the AIAR has beaten the students for the past three years! On Saturday, we hold our annual general assembly at the Gstaad Palace, followed by a dinner. It’s quite extraordinary how many busy alumni with important, high-powered jobs make time to fly in. We have members coming from the furthest corners of the earth to sit in the back of a room in the basement of the Palace and listen to the reports of their beloved Association. They love the school so much; I find their dedication very humbling. What other activities does the AIAR organise? Apart from the various dinners and get-togethers, we also organize trips to interesting places. The first trip took place when Le Rosey alumni were invited by the Shah of Iran for a visit. It was wonderful. They were picked up here in Switzerland, flown to Iran and given the most incredible tour of the entire country. Since then we’ve organised trips to many different parts of the world. About 60 alumni recently went on a wonderful trip to Bhutan. We’ve also had trips to the Galapagos, Panama and Vietnam. In January, we made a trip to Norway to see the northern lights. There is never a dull moment! Thank you Mehran. We wish you and the AIAR all the best for your upcoming long weekend.